Dr. Farmer is a native Texan, born and raised in the Dallas-Fort Worth area. Following graduation from Haltom High School, he attended Texas Tech University. Dr. Farmer proceeded to attend the University of Texas Medical Branch at Galveston where he received his medical degree. He then completed four years of specialty training in Obstetrics- Gynecology at Baylor University Medical Center in Dallas. In 1988 he began his private practice in Mid Cities area. As a Board Certified Obstetrician-Gynecologist, Dr. Farmer is committed to providing state of the art health care in a caring and compassionate manner. His office is dedicated to providing a level of service above and beyond the norm. Dr. Farmer has extended his commitment to care by providing services in weight loss management. 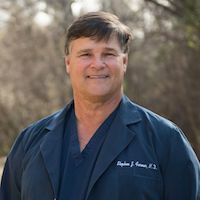 In addition to his professional accomplishments, Dr. Farmer is married to his high school sweetheart and is the proud father of four daughters and one son. His blessings continue to grow with four grandsons and counting. In addition to medicine, Dr. Farmer enjoys golfing, fishing, traveling, photography, and spending quality time with his family.